The roots of this equation, , define the vertices of a -sided polygon in the complex plan. 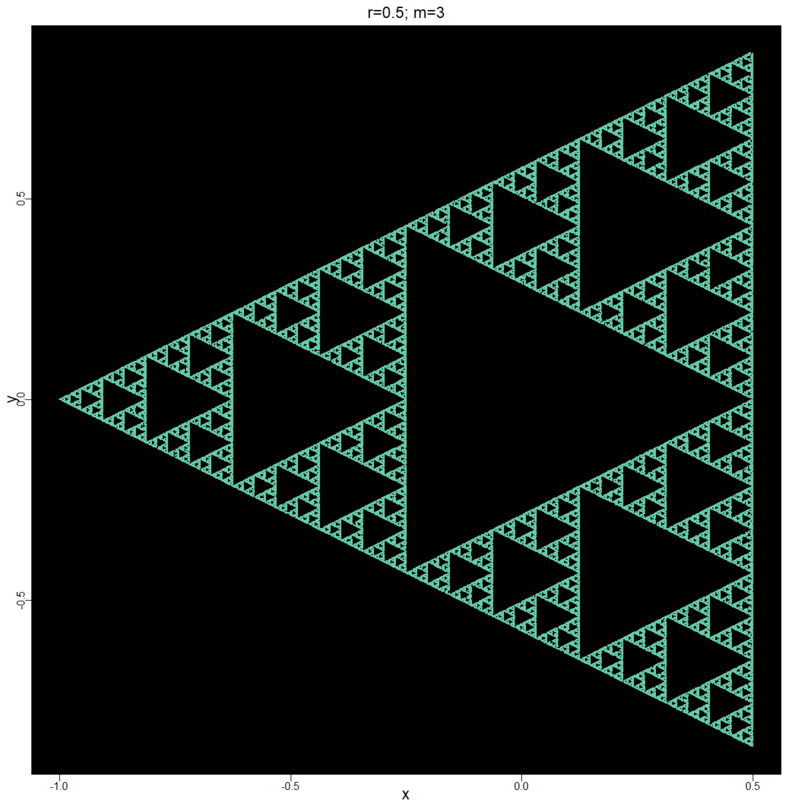 For example, if , we get an equilateral triangle defined by the roots . where is one of the roots chosen randomly with equal probability as the others in each iteration of the map and . 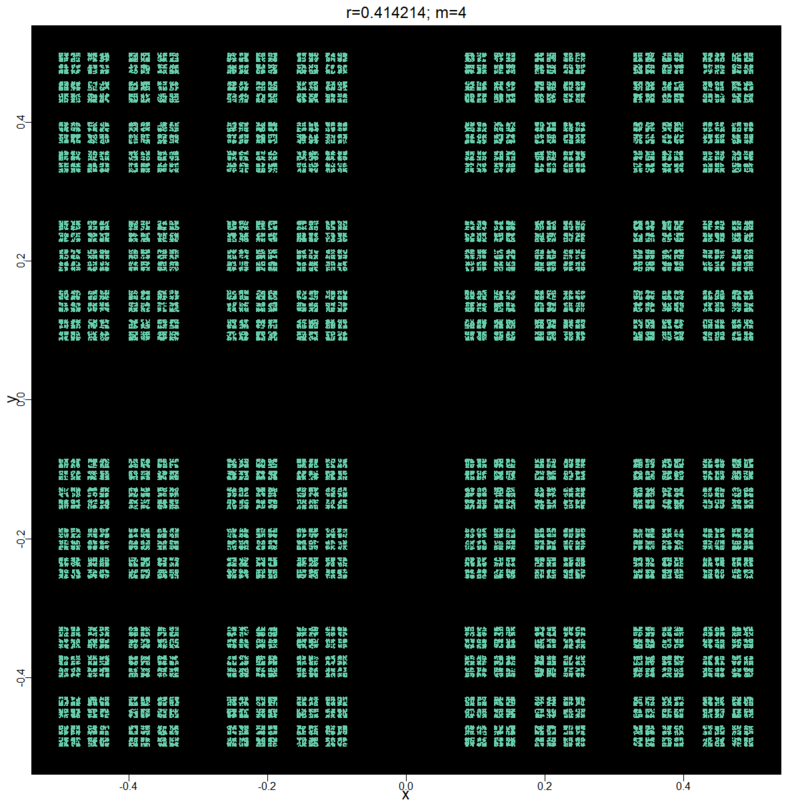 If for any we get a random-walk structure (Figure 1). 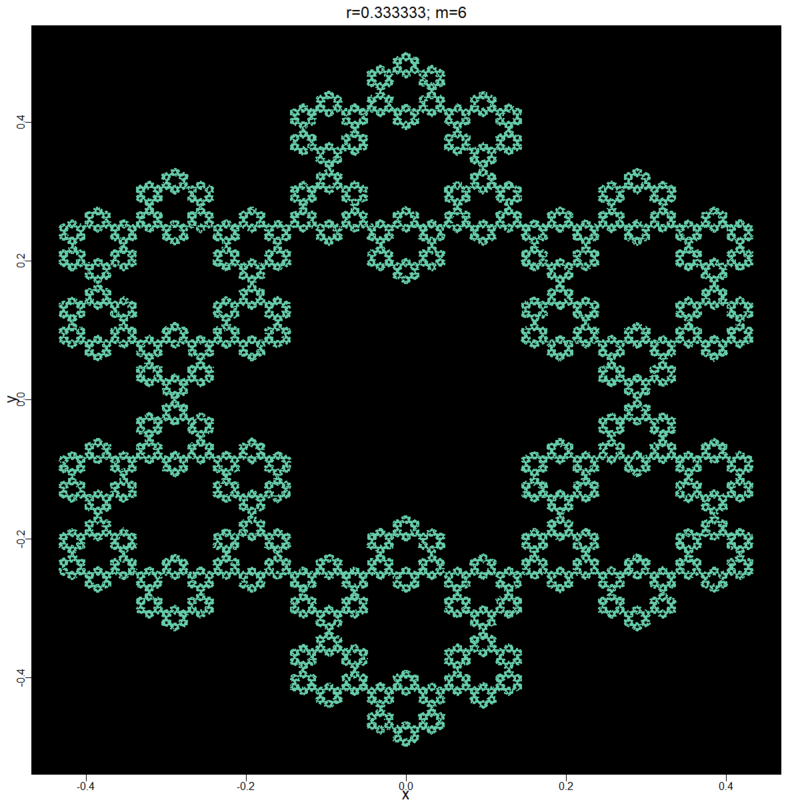 For we get the fractal street block (Figure 3). We currently revisited this map because of a curious problem that emerges when we continue this operation as below for further polygons. For (where , the Golden Ratio) we get the fractal pentagons surrounding the interior penta-flake (Figure 4). 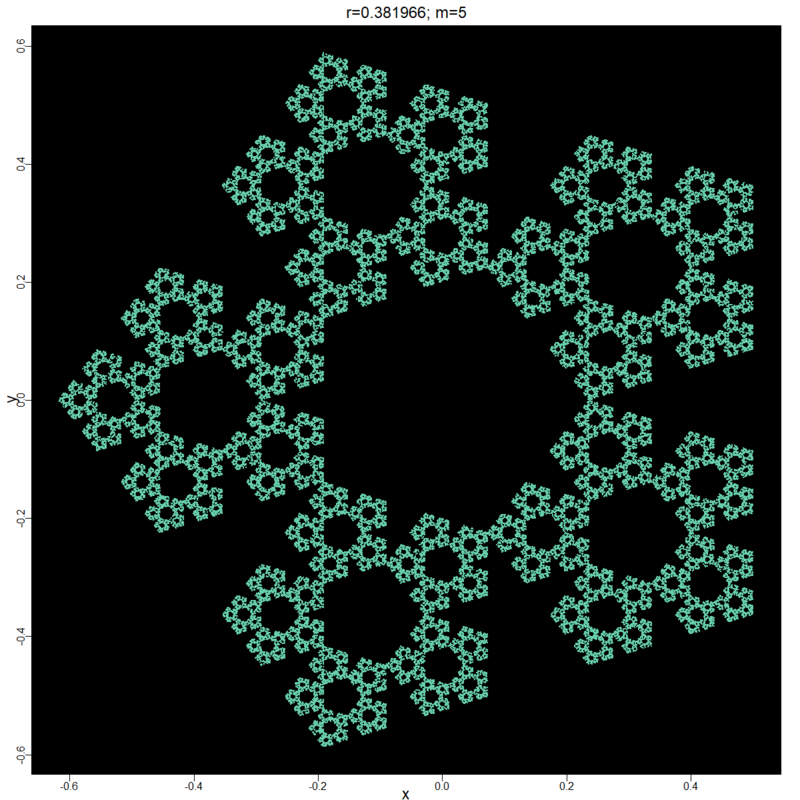 For we get the fractal hexagons surrounding the interior Koch’s snowflake (Figure 5). For (where , the Silver constant. The Silver constant is an algebraic number which is the real root of the cubic ) we get the fractal heptagon necklace surrounding the interior hepta-flake (Figure 6). 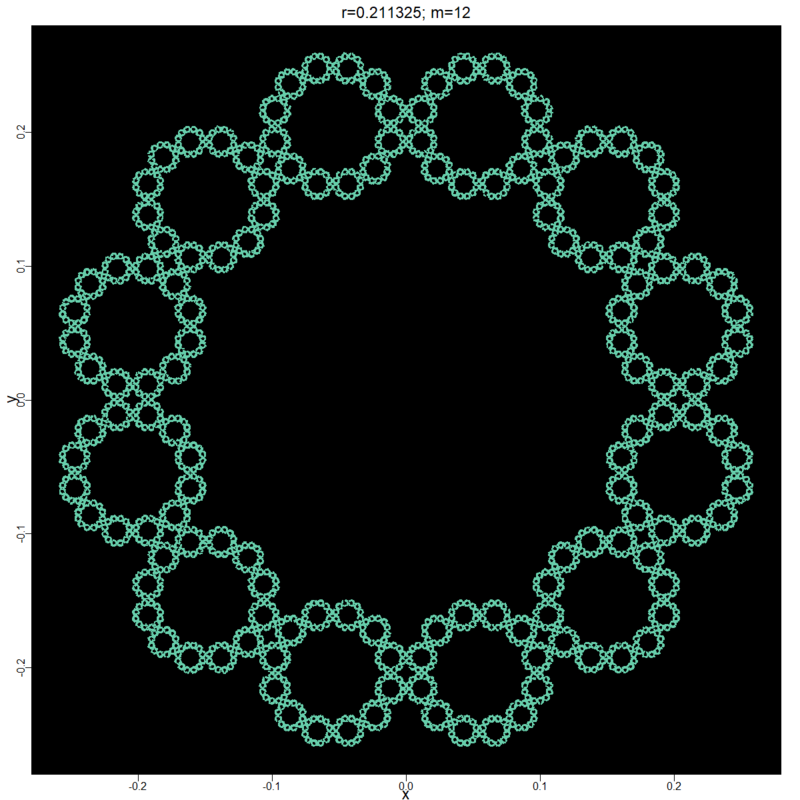 For we get the fractal octagon necklace (Figure 7). 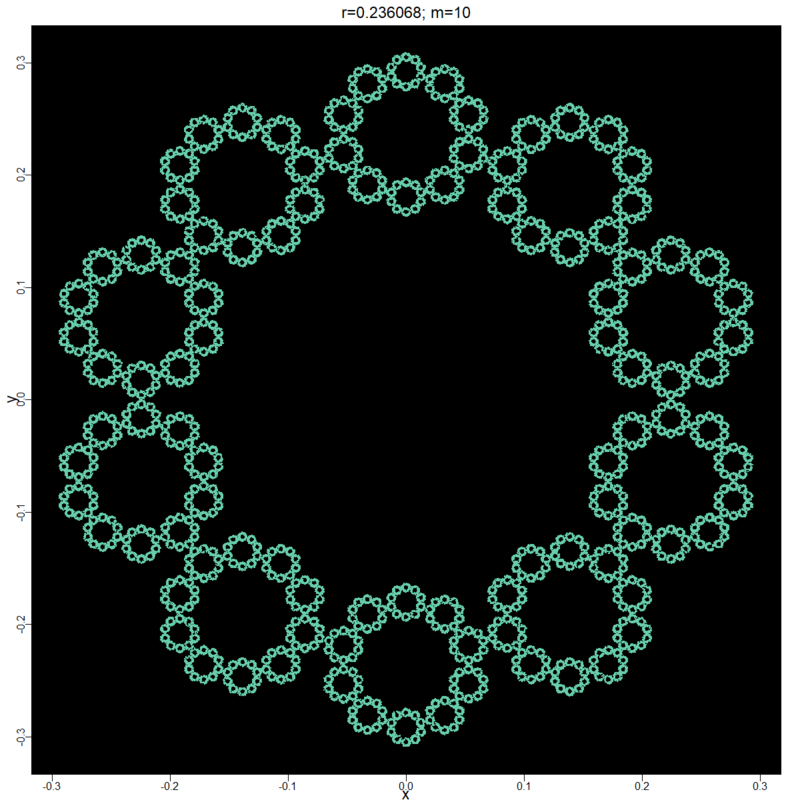 For we get the fractal nonagon necklace (Figure 8). 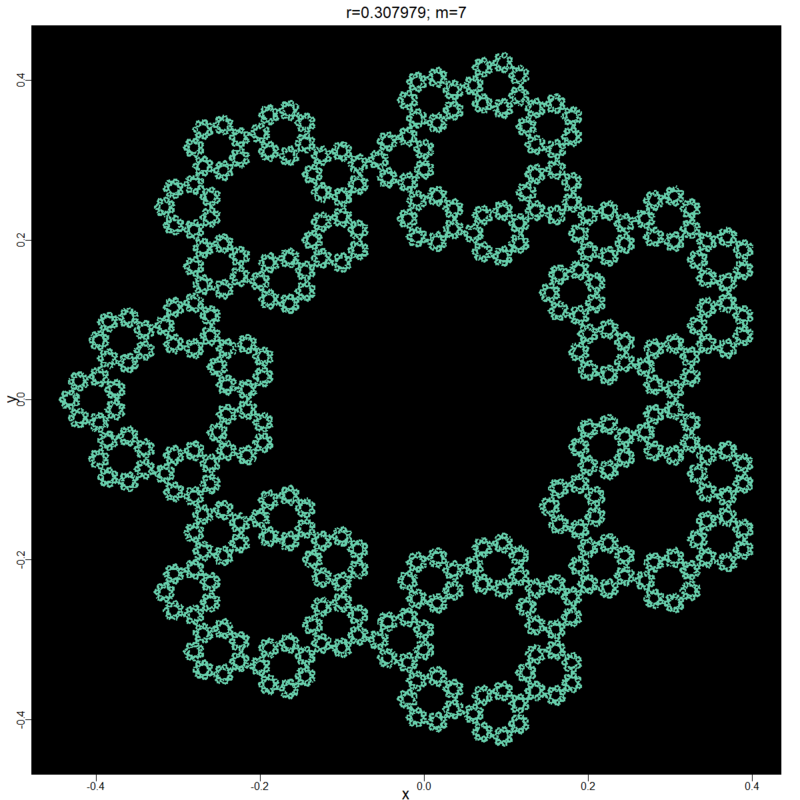 For we get the fractal decagon necklace (Figure 9). 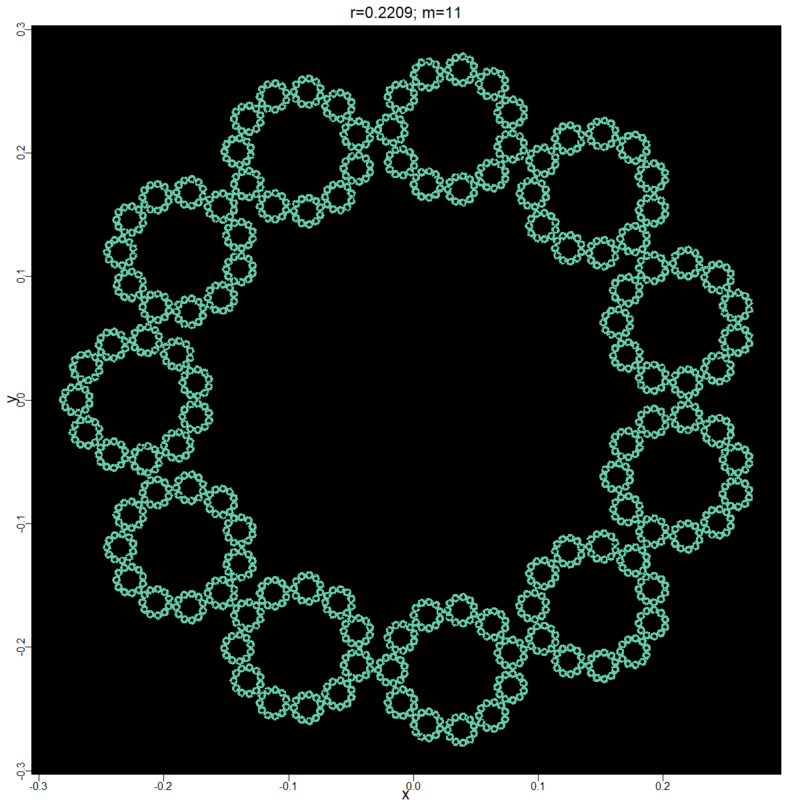 For we get the fractal hendecagon necklace (Figure 10). 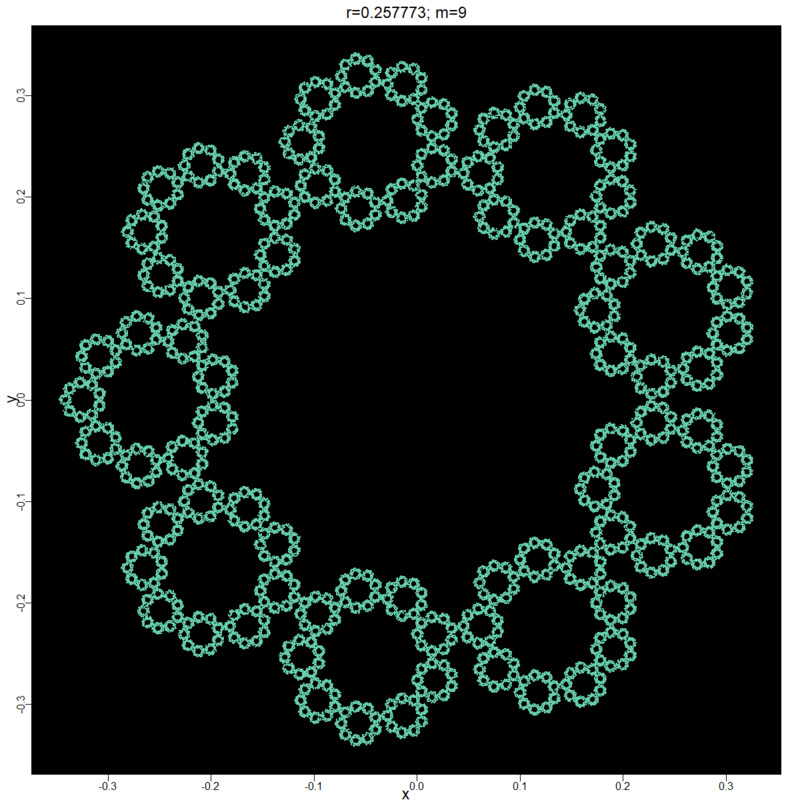 For we get the fractal dodecagon necklace (Figure 11). Given that these attractors are fractal, they have an infinite perimeter but occupy a finite area. Thus, one can define a common feature for the above attractors namely “tangency” of the fractal elements, i.e., each polygonal unit is distinct from its neighbor with the same scale-factor but at same time makes a contact with it like a tangent. While for the triangle and the square this definition is a bit murky, it is clearly visible from the pentagon onward. 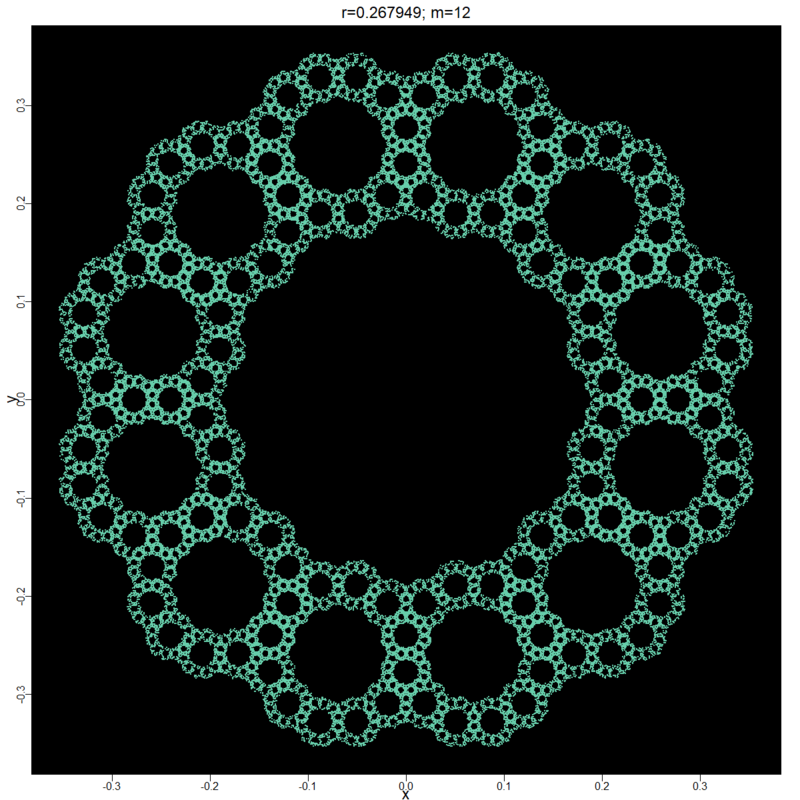 It can be contrasted with other fractal attractors obtained by this method where the elements overlap or are shared. For instance for , we have the expected dodecad structure but two dodecad sub-elements are shared by each of the adjacent elements (Figure 12). 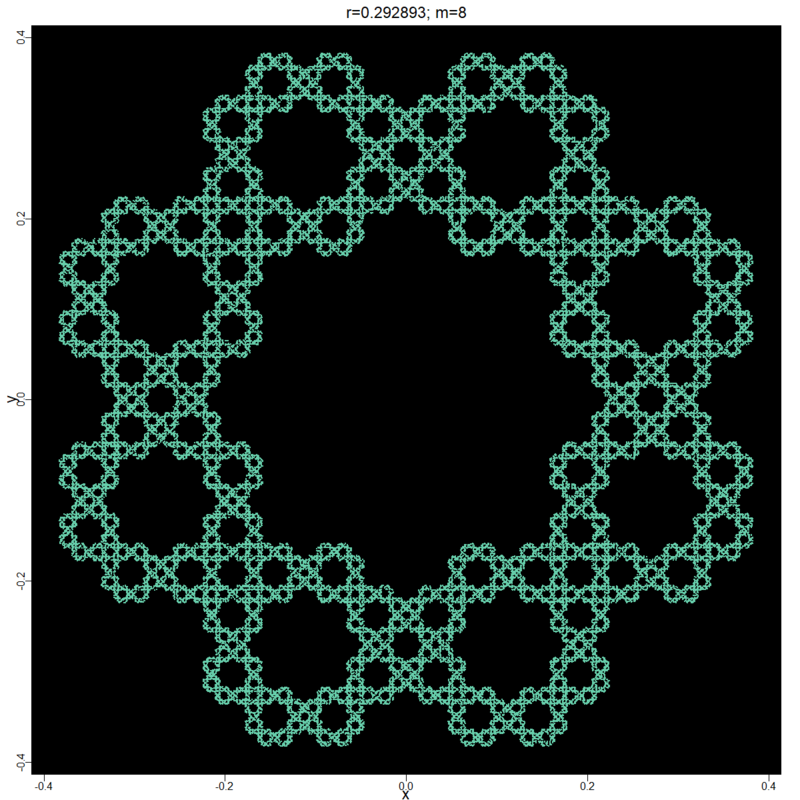 For it is the reciprocal of , which are known as Beraha constants ( ) that appear in graph-coloring theory. However, for this principle clearly breaks down: e.g. for , we see that yields the overlapping attractor (Figure 12). We have been able to obtain closed forms for the that yield tangent attractors for all except 11, where we report an empirically determined approximate value. What is the closed form expression for it? This leads to the question of whether there is a general formula to obtain our that results in tangency? To our knowledge these have not been answered. 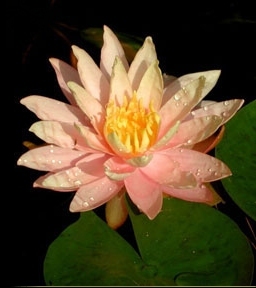 This entry was posted in art, Scientific ramblings and tagged chaos, complex numbers, fractal, fractals, geometry, Golden Ratio, IFS, polygons, recreational geometry. Bookmark the permalink.